Jockey Opie Bosson rides Avantage to victory during Golden Slipper Day at Rosehill Gardens. 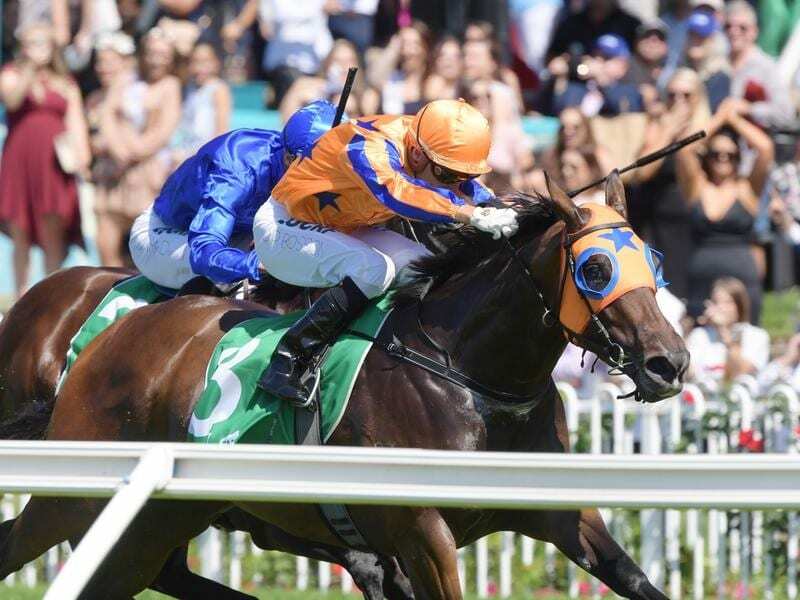 Star New Zealand filly Avantage has made a triumphant return to racing with a determined victory in testing conditions in the Group Three Birthday Card Stakes at Rosehill. Having her first start since winning the Group Three Gold Trail Stakes at Hastings in September, the Jamie Richards-trained three-year-old rallied strongly in the straight after leading in Saturday’s 1200m race to beat favourite Resin ($4.40) by three-quarters of a length. Star Reflection ($16) was another 1-3/4-lengths away third on a track rated a heavy (8). Avantage ($5.50), making her first Australian appearance on Saturday, took her record to seven wins and a second from eight starts which includes a Group One win in the Manawata Sires’ Produce Stakes (1400m) for two-year-olds in March last year. “If anything she probably should be unbeaten,” Richards said. “She got back last and ran home in the quickest sectionals of the day last year when she got beaten (in the Group One Sistema Stakes). She’s very exciting. “She went off a bit, up high behind after she won at Hastings and she just needed a bit of time to come through that. “But it’s been a great effort by the team to get her back here in such great order. The Group Two $1 million Arrowfield Stud Stakes (1200m) for three-year-olds at Randwick during The Championships now looms for Avantage. “She’s always been a high-class filly and hopefully we can work through to The Championships now with a little bit of confidence that hopefully she can step up,” he said.